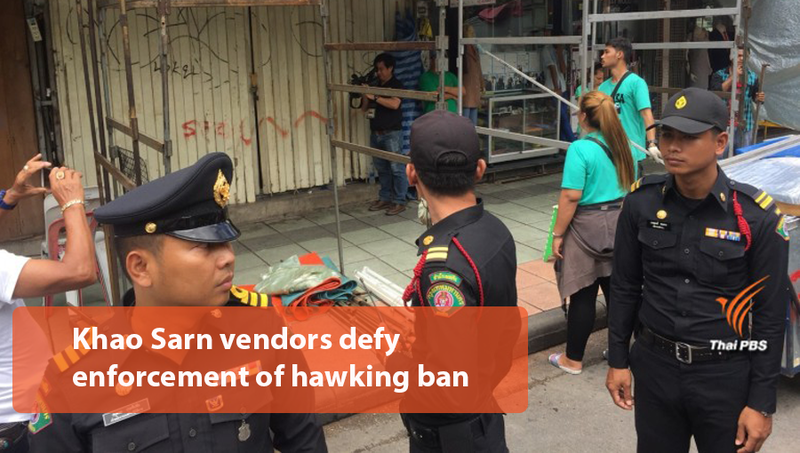 Many vendors rebel against hawking ban on pavement of the world-famous Khao Sarn Road which goes into effect today. Vendors on Khao Sarn road, an area renowned for street foods and popular with western backpackers, have openly defied the City Hall’s vending ban on the sidewalks. 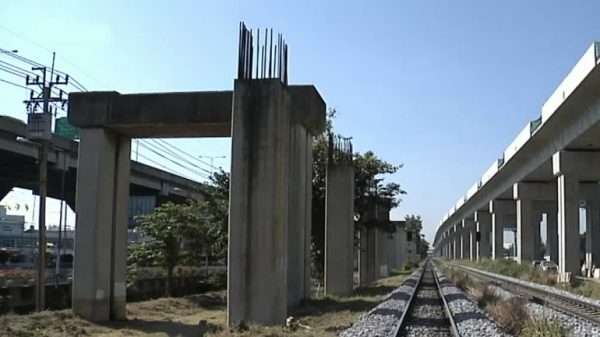 Officials of the Bangkok Metropolitan Administration said they wanted to impose order in the area which for years has been occupied by vendors who ply their trade on both side of the roads. They launched a major clean-up of the street today but met strong resistance from many vendors and plan to limit their trading hours to 6pm-midnight. 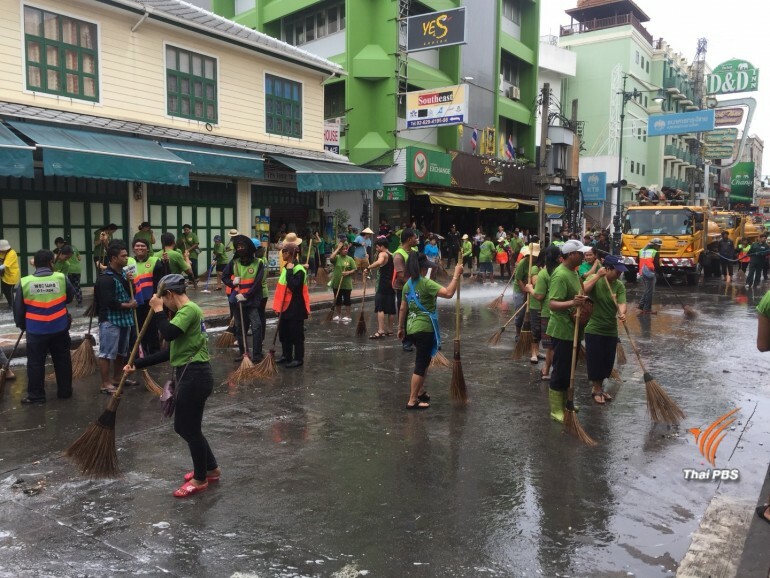 City workers during a big clean-up of Khao Sarn Road on Wednesday. 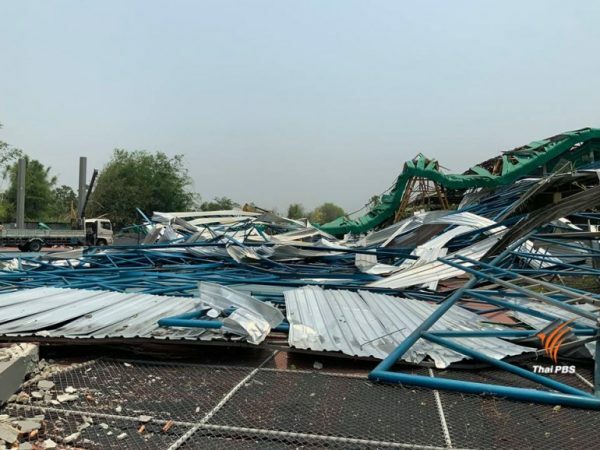 Many vendors joined the cleanup but only to re-erect their stalls afterward and demanded the city administration to put off the vending ban on the pavements which went into force today. Earlier, on Tuesday about 100 vendors converged in front of the City Hall to protest the vending ban. They also submitted a petition to the government. 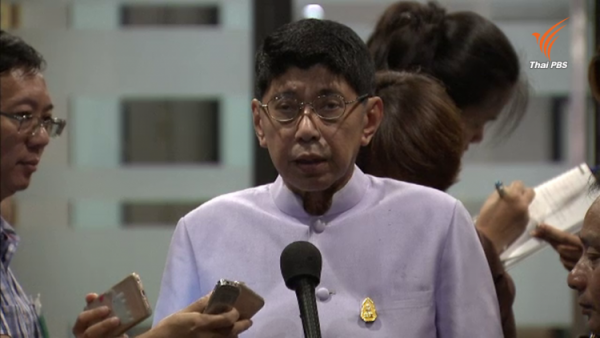 Bangkok deputy governor Sakonthee Patthiyakul said vending on the street pavements is illegal even though the vendors have been there for many years. He said under a new arrangement, vendors would be allowed to carry on with their trade on the road surface from 6 pm to midnight – not on the pavements almost throughout the day and night as it used to be. He said that vendors would each be allotted with an equal space to put up their stalls on the road surface by means of lot drawing. This, he explained, will do away with the monopoly of the trading space by some “influential” vendors who own a big chunk of pavement space and rent parts of it out despite the fact that pavements are public property and cannot be owned by any individuals. Municipal police director Mr Thiraphan Athiratthanaporn said the City Hall would discuss with Metropolitan Police Bureau to ease traffic regulation on Khao Sarn road so vendors can do their trading on the road surface. Ms Yada Pornpetchrumpa, a leader of the Khao Sarn vendors, told Thai PBS that the vendors wanted to continue with their business today in an apparent defiance of the vending ban. “Have they asked the people?”, Ms Yada questioned the vending ban, adding that the move would destroy image of Khao Sarn as a walking street that the vendors have been building for decades until it has become famous worldwide without relying on state budget. 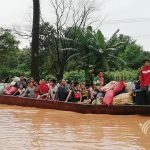 “How much revenue that the state has earned from the tourists? The local authority (City Hall) has never given us any budget, but they chose to destroy the vendors,” Ms Yada lamented.